"Stick Control": In the words of the author, this is the ideal book for improving "control, speed, flexibility, touch, rhythm, lightness, delicacy, power, endurance, preciseness of execution, and muscular coordination," with extra attention given to the development of the weak hand. This indispensable book for drummers of all types includes hundreds of basic to advanced rhythms and moves through categories of single-beat combinations, triplets, short roll combinations, flam beats, flam triplets and dotted notes, and short roll progressions. "Master Studies": This is the book on hand development and drumstick control. Master Studies focuses on these important aspects: accent studies, buzz-roll exercises, single and double-stroke patterns, control studies, flam patterns, dynamic development, endurance studies, and much more! 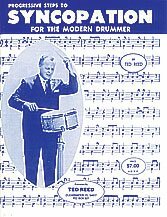 "Syncopation": Progressive Steps to Syncopation for the Modern Drummer is one of the most versatile and practical works ever written for drums. Created exclusively to address syncopation, it has earned its place as a standard tool for teaching beginning drummers syncopation and strengthening reading skills. This book includes many accented eighths, dotted eighths and sixteenths, eighth-note triplets and sixteenth notes for extended solos. In addition, teachers can develop many of their own examples from it. 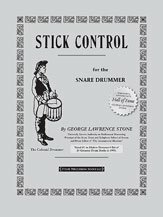 "The Drumset Musician": This beginning- to intermediate-level book contains hundreds of practical, usable beats and fills. It teaches how to apply a variety of patterns and grooves to the actual performance of songs. The CD includes demos and 14 play-along tracks covering rock, blues and pop styles, with detailed instructions on how to create exciting, solid drum parts. It's the most realistic – and fun! – way to learn drums.